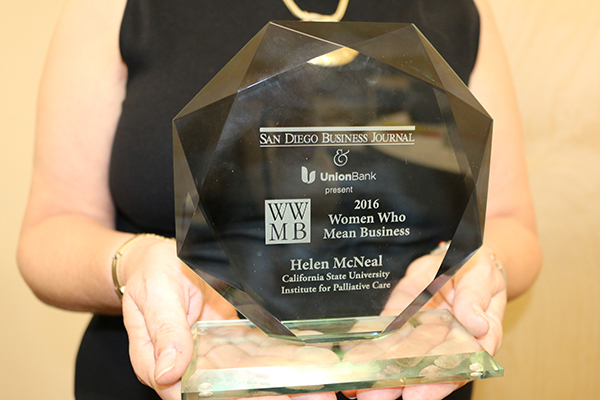 CSU Institute for Palliative Care Executive Director Helen McNeal was honored on Nov. 9 with a “Women Who Mean Business” award, given annually by the San Diego Business Journal. Nominations are submitted by businesses and organizations to spotlight women leaders who have broken new ground, significantly contributing to their industry and to the community. McNeal was one of 25 awardees among a field of 227 nominees. California State University San Marcos President Karen S. Haynes nominated McNeal. 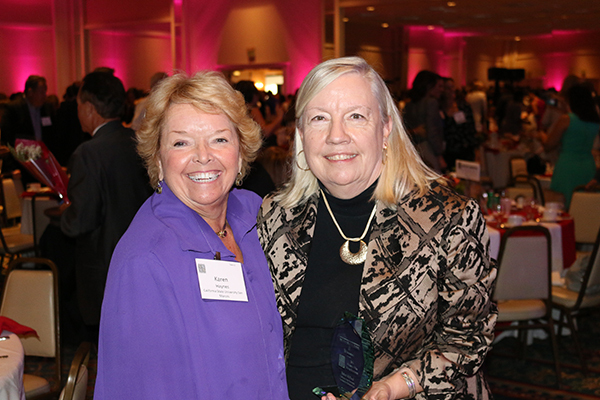 The awards luncheon, which was held at San Diego’s Town and Country Resort & Convention Center, featured a moving address by Irene Oberbauer, dedicated volunteer and philanthropist, who received the Lifetime Achievement Award. Oberbauer movingly shared her philosophy on living life after losing her sister to breast cancer and her personal experience living with cancer. Under McNeal’s leadership, the CSU Institute for Palliative Care has had an amazing, constantly progressing journey. The Institute was launched four years ago as a system-wide initiative of the California State University system thanks to the vision of President Haynes, who understood the need for supportive care for an increasingly aging and chronically ill population. Haynes appointed McNeal as the founding executive director with the charge to increase awareness of and access to palliative care by educating current and future healthcare professionals and community members. Through its work, the Institute is impacting the critical shortage of nursing, physician, social work, spiritual and other professionals with palliative care skills and training. Under McNeal’s leadership, the Institute has pioneered a groundbreaking educational model that delivers best practices while expanding the base of professional care providers who embrace an interdisciplinary standard of care. The Institute leverages the strength of CSU’s system through its 23-campus workforce development infrastructure and solid community relationships to fulfill the Institute’s mission.